Bird strikes are the greatest potential hazard to aircraft, especially during migration season. Bird strikes are the greatest potential hazard to aircraft because of their size, abundance, or habit of flying in dense flocks. This time of year, airplanes are at a much greater risk to bird strikes by Canada geese. These bird strikes increase during the migration months of March, April, August, September, October and November. 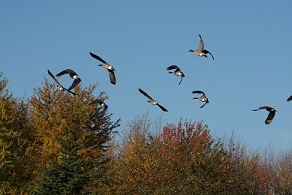 The altitudes of migrating Canada geese vary with winds aloft, weather fronts, terrain elevations, cloud conditions, and other environmental variables. While over 90% of reported bird strikes occur at or below 3,000 feet, strikes at higher altitudes are common during migration. Pilots are cautioned to minimize en route flying at lower altitudes during migration. The US Department of Transportation reports the birds smack into American planes five times more often in 2012 than they did in 1990. Pilots are encouraged to review their emergency procedures when operating from airports with known bird hazards or when operating near high bird concentrations (ie. major migratory flyways). The most serious strikes involve when a Canada goose is ingested into an engine and there is a sudden loss of power or engine failure or windshield strikes which result in pilot confusion, loss of communication or aircraft control problems. An experienced pilot will be able to avoid collision by climbing to higher altitudes and handle an emergency. Canada geese can be blamed for the “Miracle on the Hudson” crash outside New York City in January 2009, disaster was averted through the quick actions of the pilot. It is also important for pilots to report bird strikes (http://wildlife.faa.gov). The data derived from these reports are used to develop standards to cope with this hazard and provide data for control efforts. Ohio Geese Control helps airports develop a wildlife management plan which takes many factors into consideration including: public perception, cost and permits. Some methods that are involved in an overall plan include: removal, habitat modification, chemical repellents, audio/visual repellents, and trained border collies. The combination and timing of the tactics in the plan is key to lowering the geese populations in and around airports. Why are the geese loosing their feathers? Every Summer, Canada geese will rejuvenate their flight feathers for Fall migration. This process of loosing their feathers is called molting. Unlike other song birds, which only loose one feather at a time, geese will loose all of their flight feathers, which does not allow them to fly. What this means, is that if geese are on your property when they are molting, they are not going to leave. This is why Ohio Geese Control provides aggressive tactics before the molting begins. With the early Spring and the unusual dryness of the season, molting season may come a couple weeks earlier in Northern Ohio (Toledo, Sandusky, Cleveland, Akron, Canton). Typically, our season is from the end of June through the first week of August. Keep an eye out for those feathers, and that will be the indication that the process has started. Once the geese begin to molt, there is not much you can do. You can continue to harass the geese to let them know they are not wanted and try to curb them away from populated areas like doorways or parking lots, but they will not go far. The molt process should be over in 4-6 weeks. If you need assistance in lowering your geese populations before they begin to loose their feathers, please call us at 877-914-3373. We can provide you a free site demonstration and show you how good our services can work, and how quickly. Don’t wait too long. 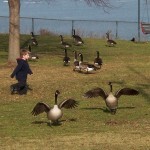 Canada geese are very territorial in the Spring. When they are nesting or have goslings running about they become extremely aggressive if they think they are being threatened. Walk too close to their territory and they will charge. They do not stop until they feel there is no longer a threat. This should not be taken lightly, we have had reports of broken noses, broken ribs and even deaths caused by Canada geese attacks. One day you can be feeding the geese, and then find yourself being attacked walking to your car in the parking lot the next day. This behavior is showing up earlier this year with the warmer winter we have been having. Also, it is important to note, that Canada geese are protected under the Migratory Bird Act. It is against the law to bring harm to any Canada goose, gosling or egg. Which is why it is important to understand the behaviors of the geese and implement a program to help control the population in urban environments as early as possible in the Spring. 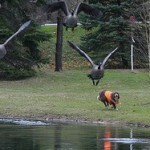 How do you stop a goose attack? Alert the public or local residents that they should not feed the geese. Do not let the geese become comfortable in your area or around people. If the geese have already nested and the nest is located in a very public spot, work with the Division of Wildlife to see if the nest can be moved. Start a Canada geese management program as early as possible in the Spring. It is important to get rid of the geese before they lay their eggs. Once they lay their eggs, they will not relocate. If you apply harassment techniques in February, you have a greater chance of success. If the geese have already laid their eggs, do not wait until next year to start your harassment program! Do not let them feel comfortable on your property, or the pair you have today will be a gaggle of geese next year with bigger problems. 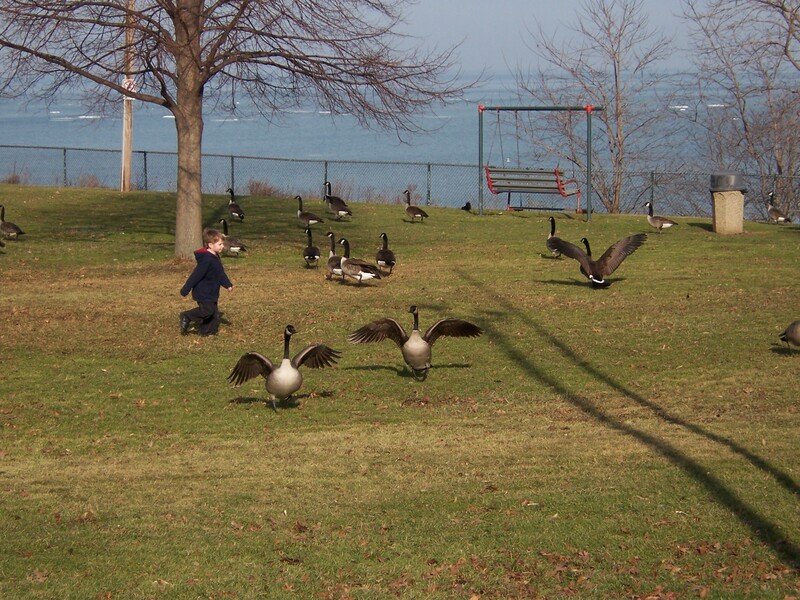 Know a location in that is a hazard to the public due to the urban Canada geese population? Report it to Ohio Geese Control, and we will help resolve the issue proactively. The best coyote decoy is using a real trained border collie. 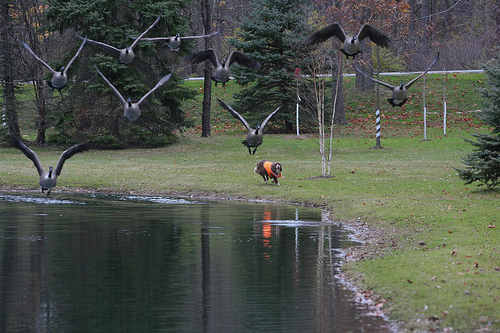 We constantly get asked about those fake coyotes, and if the decoy actually works to get rid of geese. And our answer is yes and no. 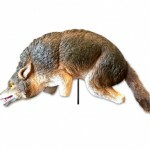 The purpose of the coyote decoy is to instill the fear of a predator at your location. The best way to instill the fear of a predator on site is to use a live, skilled border collie that has many similarities to a coyote. Their wolf-like glare, and crawl up motion make the geese think that they are a predator. Yet they are trained to work with their handler to chase the geese away, but never harm them. Canada geese are intelligent animals. They can understand when a fake coyote is placed in their neighborhood, especially if the coyote is not moved constantly. They become use to it being there, just like humans do, and they understand it will cause them no harm. We do, however, incorporate them when an integrated approach to Canada geese management is needed. They are effective when used in combination with the border collies. Especially in areas that are not conducive to the dog running around, like islands, rooftops, and particularly rough areas. The decoy alone will not be as effective, as when combined with the border collie. The coyote decoy must still be moved several times a day, and not be stagnate in one location. 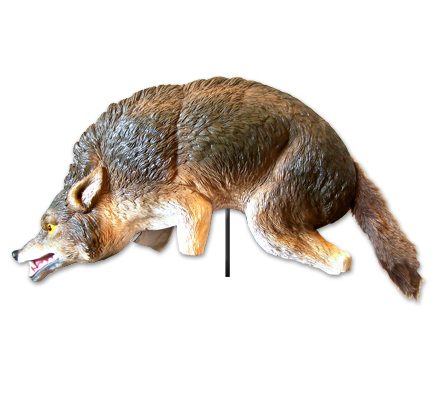 Using a fake coyote decoy by itself with no additional tactics will have limited success, and not be an effective long-term solution. For more information about our Canada geese management programs, simple request a free site demo and we provide you some initial consultation to assist with you with lowering your Canada geese population. Celebrate our 10-year anniversary with us, and let us know how we are doing! "With Ohio Geese Control I have reduced my annual maintenance budget by $7,000. We have received many positive comments from our community and staff. We value their services and would recommend them without reservation." Ohio Geese Control’s mission is to create a healthier and happier environment by humanely managing migratory bird populations. We want you to enjoy your outdoors. When working with us, you have the peace of mind in knowing that we are reputable, highly trained professionals you can rely on to design a custom geese management program guaranteed to deliver results in a timely and professional manner.